Zucchini was on sale this week, which means (you guessed it) I bought some and just HAD to cook with it! Way back in the dusty corridors of my personal veg history, I used to get Taste of Home magazine. One summer issue featured quesadillas, among them a very tasty recipe for zucchini quesadillas. Downside? Cheese, and lots of it. What I made last night was sort of a zucchini quesadilla redux. I took what I remembered best about the recipe, swapped vegan nacho cheese sauce for the dairy cheese, and voila! Zucchini quesadillas with cheezy sauce were born! I used the cheese sauce recipe from The 30-Minute Vegan‘s “We Will Rock You 3-Layered Nachos” recipe, but you can use any cheese sauce you prefer. The recipe made enough for six people, so I’ve listed the reduced recipe below since this only makes two servings. It was hot as you-know-where yesterday, so I chose to brown the quesadillas on the stovetop. However, I also love baking them in the oven to get an extra-crispy tortilla, so I’ve included instructions for both methods. 1) Heat oil in a large skillet over medium heat. Add the garlic and cook until fragrant, about 30 seconds. 2) Add the onions and pepper. Cover and cook until soft, about 5 minutes, stirring occasionally. 3) Add the zucchini, hot sauce, and spices to taste. Be careful with the hot sauce–too much may make the mixture wet or runny. 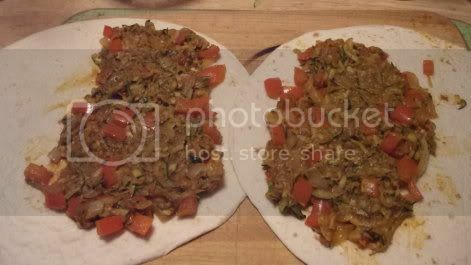 Cook until the zucchini has absorbed the spices and is reduced in size, 3-4 minutes. 4) Remove zucchini mixture from the heat. Spread 1/2 of the mixture on the bottom half of each flour tortilla and fold over. 5) While the quesadillas are browning (with either method below), prepare the cheese sauce. Place quesadillas on a cookie sheet or pizza pan and bake at 350°F for 10 minutes, turning once, until the tortillas are lightly browned and crispy. 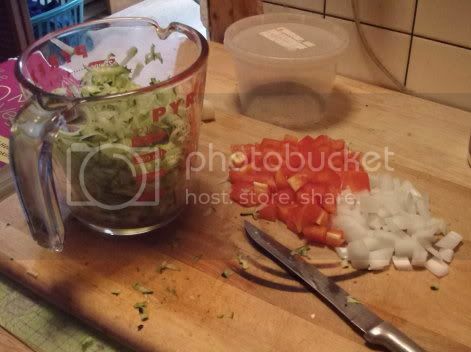 Gently wipe out the pan used to cook the zucchini mixture and place the quesadillas in it. Return to the burner and brown over medium heat for 5-6 minutes, until the tortillas are crispy, turning as needed. 6) Whisk together the cheese sauce ingredients (below) in a saucepan over medium heat. Continue to whisk until the mixture thickens. Remove from heat and set aside. 7) Once the quesadillas are browned and crispy, transfer to a plate. Garnish with chopped tomatoes, shredded lettuce, avacado…whatever you prefer. 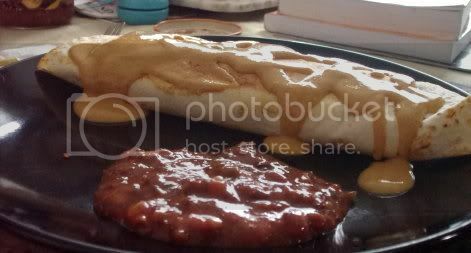 Pour 1/2 of the cheese sauce over each quesadilla and serve hot with your favorite salsa. In other news, I’ve been reading Fast Food Nation (finally), and boy is it scary. It astonishes me that a book like that has been around for nine years, hit the New York Times Bestseller list, and yet people still consume vast amounts of fast and processed foods. I can understand the difficulty of breaking a lifelong, industry-backed mindset towards meat and dairy consumption, but in a world where heart disease, hypertension, and obesity run rampant, it baffles me that more people don’t understand that eating food that’s not food is bad for them. Question for the comments: What mainstream attitudes about food confuse or baffle you the most? The quesadilla looks fab! I’m reading Eating Animals right now and what baffles me is how much people, including my husband, do not want to hear the facts. Ignorance truly is bliss. I thought that was a great book. But you’re right–it’s astonishing how people just plain “don’t want to know”! My dad is the same way. I think a lot of people would rather live in ignorance than face the possibility that the choices they’ve been making all their lives are unhealthy, cruel, or just plain wrong.